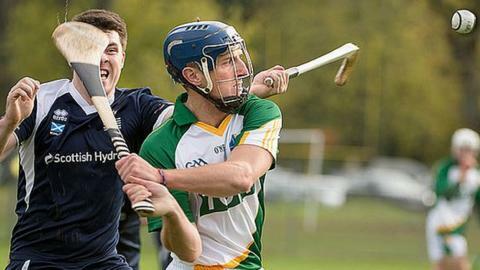 Scotland face Ireland this weekend as the first leg of the annual shinty/hurling international takes place at Bught Parks in Inverness. Scotland's last win in the series was back in 2009. However, under new manager and shinty supremo, Ronald Ross, the Scotland team have a new lease of life and are confident going into the home tie. Because neither shinty or hurling are played at a top level in any other countries, the yearly match-up between the sister sports presents players with an opportunity to represent their sport and country on an international stage. At first glance for the uneducated of the composite rules, the points system may take a minute or two to get your head around. So here's a quick guide. If either country manages to get the ball over the bar during the run of play, they get a point. If either country manages to get the ball over the bar from a free, or from a 65 yard strike from the ground, two points are awarded. And if either country gets a goal, then three points are awarded. Even as a player it's sometimes difficult to work out how many points you are in front or behind! But there is never a dull moment or second when playing to worry too much about that! It's extremely fast and physical and not for the faint hearted and if you have never watched the two rivals battle it out before I urge you to tune in to BBC2 at 14:00 BST on Saturday, or better still, get yourself along to the Bught Parks. I am delighted and nervous to be back in the squad. It is a real honour and privilege to be back training with the team after thinking my only international call-up would involve blethering in the BBC commentary box. One question I have been continually asked since the squad was announced is, do you feel you have something to prove? I think anyone who is fortunate enough to be selected to pull on a Scotland jersey has something to prove, not only for themselves, but for their club, area and each and every other player around them. There are no hiding places on the field and there will certainly be no men in a blue strip looking for such a place on Saturday. The return leg takes place on the following weekend in Newry, Northern Ireland, and, with huge crowd expected to descend on Inverness, here's hoping we head out to the Emerald Isle with the first Test in the bag. C'mon Scotland, let's nail this!